PORT CHARLOTTE, Fla. – The Charlotte Stone Crabs return to Charlotte Sports Park on Saturday, June 5 for a four-game homestand against the Clearwater Threshers (Philadelphia Phillies). 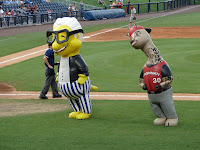 The series opener on Saturday, June 5 at 7:05 p.m. will feature in-game skits and comedy routines from the Zooperstars characters involving players, coaches and umpires. The Zooperstars are a nationally-acclaimed, traveling entertainment group who currently perform more than 200 shows a year. For more information, please visit www.Zooperstars.com. Gates will open at 6:00 p.m. The teams continue the series at 5:35 p.m. on Sunday, June 6 with gates opening at 4:30 p.m. Sunday’s game will be a Stone Crabs Kids Club Day presented by Wendy’s, so all members will receive free admission. Call 941-206-HITS to sign your child up for the Kids Club. The rubber match will be played on Monday, June 7 at 7:05 p.m. with gates opening at 6:00 p.m. for Dollar Dog Night presented by Red Hot Chicago. Hot dogs are just $1 throughout the entire game. The homestand concludes on Tuesday, June 8 with Seniors Eat Free Tuesday presented by Ruhl Law Group. All fans 55 and over will receive a free hot dog, bag of chips and soft drink with the purchase of a game ticket, which starts at just $6 for general admission. Tuesday also marks KRAFT Singles Tuesday Night tickets where fans can receive a buy-one, get-one-free ticket offer if they present a KRAFT Singles wrapper to the box office at the time or purchase. Visit KraftSingles.com for more info. Gates open at 6:00 p.m. and first pitch is 7:05 p.m.